When life is disrupted and the food supply chain is broken, people trapped in Manhattan must resort to farming on their roofs. Sky gardens become the norm, and, are a major source of food for the remaining citizens. 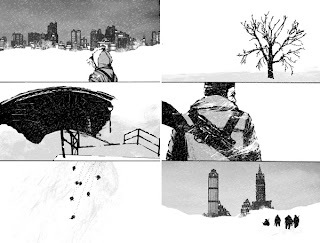 This is the scenario presented in Brian Wood’s DMZ, a comic book based in a war-torn alternate version of the United States. Of course, we all have heard of the possible benefits of rooftop gardening: how it could revolutionize the world’s food supply because people would start becoming aware of where their food comes from; how it could help erase global warming by reducing embedded carbon emissions amongst other claims. It is in that regard, that I have included the excerpt below, about Singapore’s sky garden’s. The Ngee Ann findings and the Changi Hospital example highlight the great need for a similar economic study of the potential of another Singaporean innovation â€“ the â€œsky farmâ€ concept, which would blend in well with both the food-producing potential of Singaporeâ€™s rooftop spaces, plus the potential of â€œvertical farmingâ€ down the sunlit faces of apartment buildings. Professor Lee Sing Kong, Dean, Graduate Programmes and Research, National Institute of Education, of Singaporeâ€™s Nanyang Technological University, has been advocating â€œsky farmsâ€ that use the aeroponic technology so well pioneered by Singaporeâ€™s AeroGreen Technology Pte Ltd., initiated by the Sime Derby company. Aeroponics is where a hydroponic nutrient solution is sprayed onto plant roots dangling in light-proof boxes. It allows temperate-climate fresh vegetables to be produced economically in tropical and sub-tropical climates. Professor Leeâ€™s good idea is sunlit bridges between high-rise apartment buildings or even office towers. They could be retro-fitted as single or double units at first or second-floor levels, or part of a tier of vertical structures servicing the food (and organic waste management needs) of multiple stories. My real question is this: how will the absorption of polluted air affect these plants. The discovery channel made a point of showing us crisp and leafy green lettuce the reportedly tastes delicious – but is it safe? I haven’t found an answer. Drop a comment if you know anything about this. Our girl, Jessie, is still deep in the heart of Texas, and so, as mentioned before we are holding down the green universe until her triumphant return. That said, we haven’t been doing a very good job and we apologize to you chronic readers. Our friend Erin in Iowa has been on us to post about this organization, Green Drinks, that is pretty much in line with all the fundamental MNP core philosophies. Read about it below, and visit the website to get involved in your area. Unfortunately, there is still no Boston incarnation of the group, but MNP is working on that… The fact that this exists in so many places (ie. Green Drinks Chattanooga) makes Beantown’s dearth almost unpalatable. Every month people who work in the environmental field meet up for a beer at informal sessions known as Green Drinks. We have a lively mixture of people from NGOs, academia, government and business. Come along and you’ll be made welcome. Just say, “are you green?” and we will look after you and introduce you to whoever is there. It’s a great way of catching up with people you know and also for making new contacts. Everyone invites someone else along, so thereâ€™s always a different crowd, making Green Drinks an organic, self-organising network.